On November 14, 1876 (Meiji 9) Japan’s first government owned kindergarten is established as part of Tokyo Women’s Normal School (東京女子師範学校). 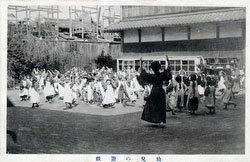 The program was a result of the efforts by statesman and educator Fujimaro Tanaka (田中 不二麿, 1845–1909). Between 1871 and 1873 (Meiji 4–6), Tanaka had travelled with the Iwakura Mission (岩倉使節団) to the United States and Europe to study educational systems. Tanaka became Vice Minister for Education in 1874 (Meiji 7) and quickly instituted wide ranging reforms. Tanaka was especially impressed by women’s education and a kindergarten he visited based on the ideas by German pedagogue Friedrich Wilhelm August Fröbel (1782–1852). Tokyo Women’s Normal School’s kindergarten’s first director was Shinzo Seki (関信三, 1843–1880). Seki translated a manual for kindergarten education written by Karl Daniel Adolph Douai (1819–1888), a pioneer of the Kindergarten movement in the US. He also wrote several books himself. among which Kindergarten Diary (幼稚園記, 1876) and Kindergarten Manual: the 20 different types of toys (幼稚園法二十遊嬉, 1879). The first teachers at the school included the German Klara Matsuno (1853–1941, 松野クララ), Fuyu Toyoda (1845–1941, 豊田芙雄) and Hama Kondo (近藤濱). 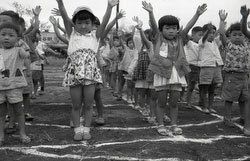 Seen from a global viewpoint, the Japanese kindergarten was unique because it was based on Fröbelian pedagogy and was the first public kindergarten established by a government. Japan’s program was so successful that in 1905 (Meiji 38) Chinese women were sent to Japan to learn kindergarten techniques. 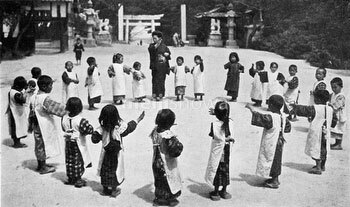 Although kindergartens spread throughout the nation after the Kindergarten Ordinance (幼稚園令) was enacted in 1926 (Taisho 15), less than 10% of the total child population actually had the luxury of attending them. A peak of 9.62% was reached in 1943 (Showa 18).